THE BEST COMPLEMENT TO YOU LAP. You can use it to load, unload, hide, prepare, as a card index... so let it do the work for you. Fold it and take anywhere. It is the ideal tool for any close-up magician who work with a table. There are so many possibilities with the Servan-T Marlo that we had to do a DVD media to explain a few handlings. Put the servant in your lap and you'll see that a bad will adapt to it in a way that nothing can fall from you lap. It keep safe not only what you lap, but also what you prepared. 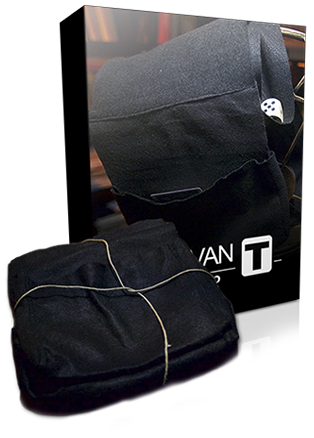 The Servan-T have a lateral pocket in each side that give you endless possibilities. Each pocket is big and flexible in a way that picking something is fast and comodo. All this is explained in the DVD media that comes with it. The central bag it's made of a lot of flaps that can be opened or closed during the performance, so you have possibilities to: continue unload (for example, you can unload a lot of coins in different moments without them touching each other), prepare objects in different levels, etc. The magic happen when you open it! The Servan-T comes with DVD media! A DVD in which Dani DaOrtiz explain all the details of this ingenious weapon for every close-up magician. The secrets in his design, going through the bag, the flaps and the lateral pockets. Ideas and handlings.